Yesterday I had a great day visiting the Museum für Naturkunde at Schloss Rosenstein, Stuttgart, and later also the nearby Wilhelma Zoo. 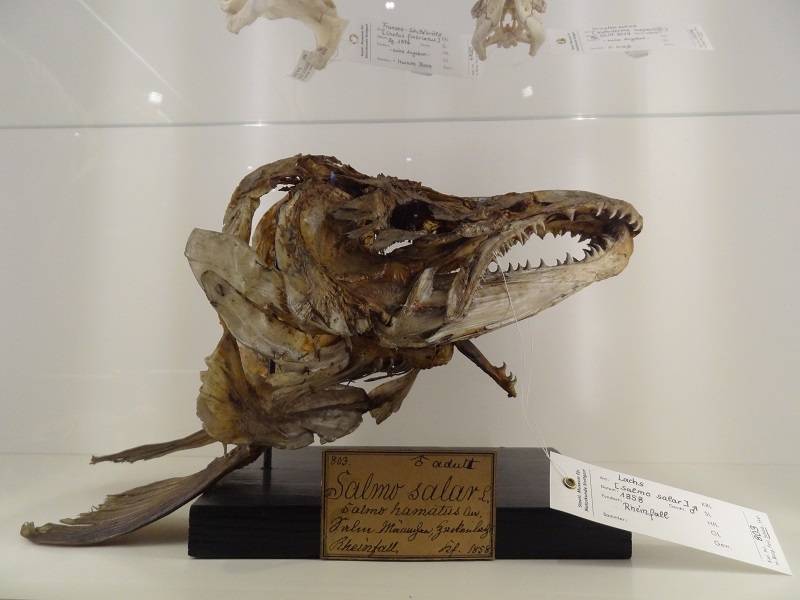 There was a special exhibition at the museum with a lot of specimens which are usually not on display, including a huge skull of an Atlantic salman (Salmo salar). It dates back to 1858 and comes from the Rhine Falls, one of the three largest water falls of Europe. Once the river Rhine was the most important water for salmon fishery in whole Europe, but this times are long gone. As a result of overfishing, control stucture and especially heavy pollution, the Atlantic salmon fully vanished from this river by the middle of the 20th century. Since water quality has increased again and as the stream was stocked with young salmons, the species is very slowly again on the rise, but it will still take decades until it will form again healthy and self-maintaining populations. 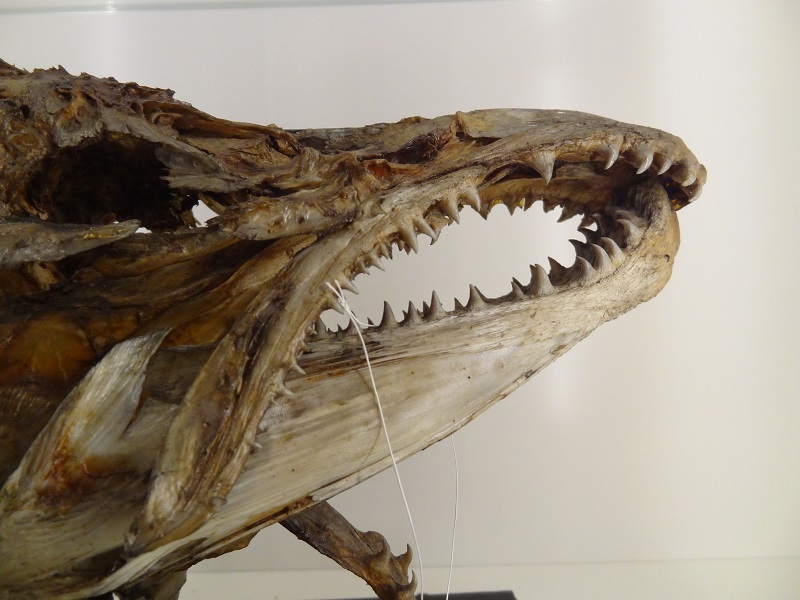 This skull belonged to a male, what´s clearly obvious if you look at the hook-shaped jaws. If you look below the mandible, you can also see the dislocated tooth-covered boney part of the tongue. 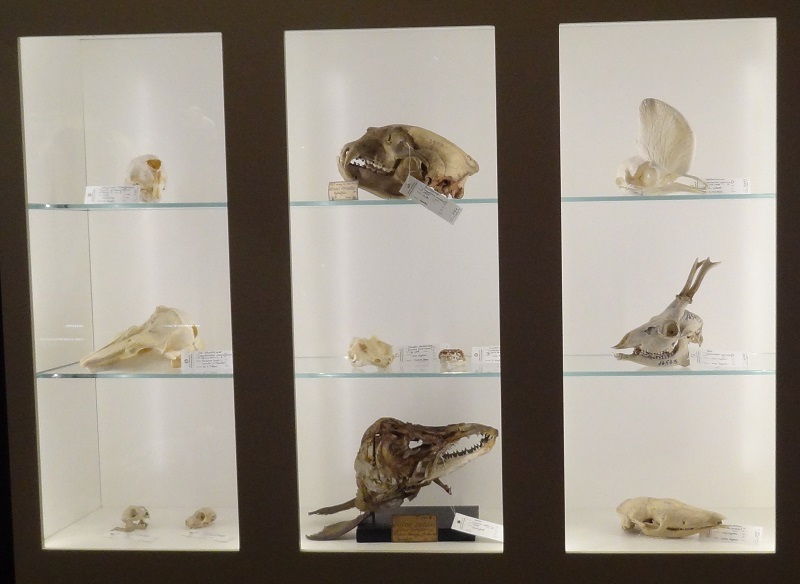 The skull above it belongs to a spectacled bear and the deer skull on the right to an adult roe deer buck, the one in the middle on the left to a subadult harbor porpoise. This brings to mind that megafauna is not just a term exclusive to terrestrial animals, but that it applies to aquatic creatures as well. And alike the terrestrial megafauna, the giants of the rivers and lakes have sadly also vanished in many parts of the world. Many large streams of Europe were once full of big and even giant anadromous fishes, like the Atlantic salmon and several species of sturgeons, but all of them have decreased extremely in number or became nearly fully extinct. Dieser Beitrag wurde unter Anatomie, Bild des Tages, Fische, Museen veröffentlicht. Setze ein Lesezeichen auf den Permalink.